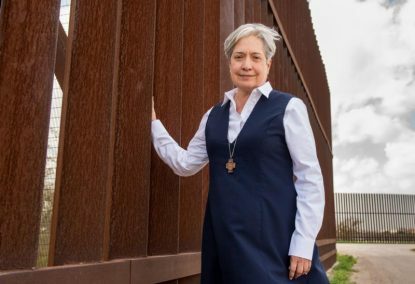 WASHINGTON (CNS) — The young Honduran woman caught the eye of Sister Norma Pimentel at the Catholic Charities-run respite center the nun oversees in McAllen, Texas. She was “real pregnant,” Sister Pimentel recalled. Her daughter, perhaps 3 or 4 years old, was by the woman’s side. The woman “held out her hand and it was all disfigured,” Sister Pimentel, executive director of Catholic Charities of the Rio Grande Valley in the Diocese of Brownsville, Texas, told an audience at Georgetown University Feb. 4. “The reason it’s like this is somebody entered my house and struck at my daughter to kill her,” Sister Pimentel recalled the woman telling her. “I put my hand there to save her. I was unable to go to the doctor or to the hospital. It healed on its own at home. I was cut here and here and everywhere. The woman’s story is one of the many Sister Norma has heard since the respite center opened in 2014. The people come to the U.S. fleeing violence and poverty “because they are afraid for their children,” Sister Pimentel said during a panel discussion sponsored by the university’s Initiative on Catholic Social Thought and Public Life. The 90-minute discussion, by design, largely sidestepped the issues surrounding President Donald Trump’s persistent push for a wall along the U.S.-Mexico border. Instead, it focused on the needs of the migrants and refugees as well as the biblical principles and moral responsibilities for responding to people in need. A border wall or steel barrier has been the keystone of Trump’s immigration policy. He has claimed, without providing corroborating evidence, that a wall is needed to address what he considers a crisis at the border. “But with that right comes a responsibility, and that responsibility is that that enforcement is humane and just and, frankly, transparent,” Feasley said. While calling Trump’s recognition to protect DACA and TPS recipients a “positive development,” Feasley called the plan “illusory.” She said the U.S. Supreme Court has declined hearing an appeal of a lower court ruling that allows the program to remain in place without an end date. “This is a negotiation and sometimes the problem here in Washington, and we’re removed from McAllen and the human reality, is that sometimes we put up people as negotiating chips. That’s terrible. We should never be sacrificing one group over another,” Feasley said. Opening the discussion, Georgetown senior Jaquelin Martinez invited the audience to join in “compassionate partnership” with immigrants rather than pity their situation and failing to act on their behalf. As a DACA recipient, Martinez has experienced the ups and downs facing an immigrant family. Her father, Jose Balmore, fled his native El Salvador in 1998, six years after a brutal civil war ended. He was able to secure TPS in 2001 after the country’s devastating earthquake, allowing him to bring his family to the U.S.